We rendezvoused at Petronas Gelang Petah on Friday, 0000h-0030h (Thursday night, really) to gather for a pre-ride briefing. At 200cc, my Pulsar was the only “small capacity” bike with the rest of the bikes (2A and CL2 big bikes) having multiple times my engine displacement, and so, the plan is for me to push off first as an “advance party” with Sufi and Siu Hon with their Honda CB400X and Yamaha XJ6 Diversion as my riding buddies (aka “escorts”). 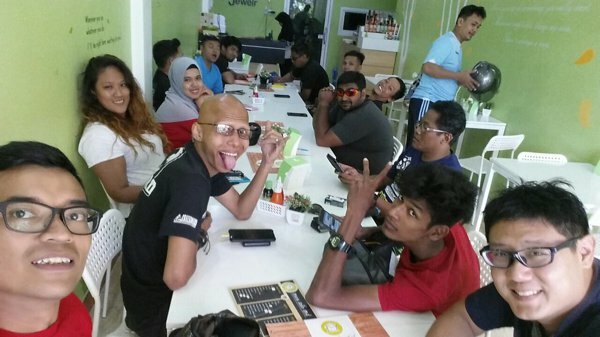 The plan was to link up with the rest of the group at R&R Sungai Perak (approximately 580km) in the morning. The big bikes will be traveling at a faster pace and should catch us up as we near Sg Perak. 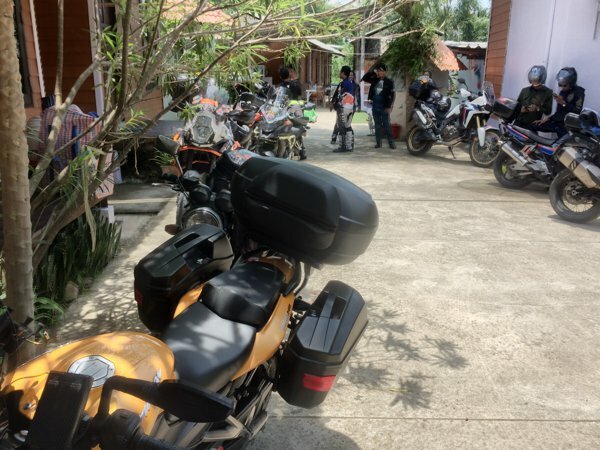 DAY 1 (14 Apr, Fri) – riding Gerik and entering Thailand. The ride up on the Malaysian NSHW was uneventful. Because I’m more of a morning person; or perhaps because I was up at 5am the day before and haven’t slept since (tried to take a short nap, but I really couldn’t); or maybe because of both, I was struggling to fight the Z-Monster sometime between 3-5am. Thankfully a can of Red Bull at a refuel stop helped. At approximately 400km mark and shortly after our 2nd refuel stop at R&R Rawang, the main group of big bikes did manage to overtake us. As they were zooming pass us, somehow, even through the darkness, the group recognised us and gave us the friendly bikers’ wave. That perked me up a little and I felt less sleepy after that. Yeah! We managed to reach Sungai Perak before the Big Bike Gang arrived! But maybe because the Big Bike Gang was a large group of 13 bikes, it took them a little longer to get everyone moving after a refuel pit stop. They probably also took longer rest stops. 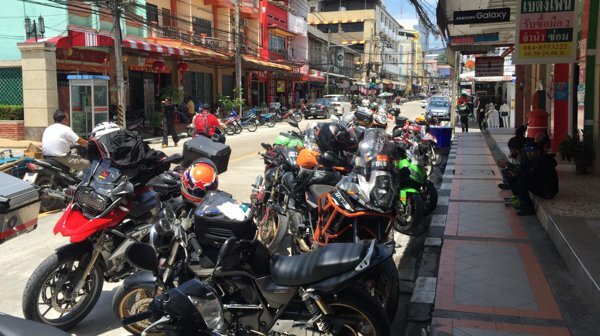 And although they overtook us after the 400km mark, the “small bike with his escorts” advance party managed to arrive at the Sg Perak rendezvous point before the Big Bike Gang arrived. The ride from Sg Perak to Pengkalan Hulu was awesome! The morning sun just broke, and the fog hasn’t quite lifted. So the surrounding hills and forests were clothed in a thin veil of fog as the sun pierced through. In the 146km northbound ride that cuts through Gerik, and although I just rode Gerik 4 months ago, I didn’t remember it to be that beautiful! Unfortunately, I didn’t have any pictures of this part of the ride as my helmet cam wasn’t adjusted properly and was pointing downwards. So all I got were videos of roads. Bummer! 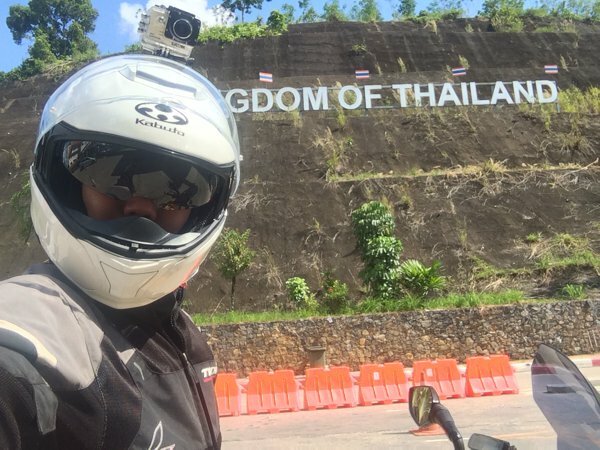 Welcome to the Kingdom of Thailand! Before long, we reached the Malaysia-Thai border. 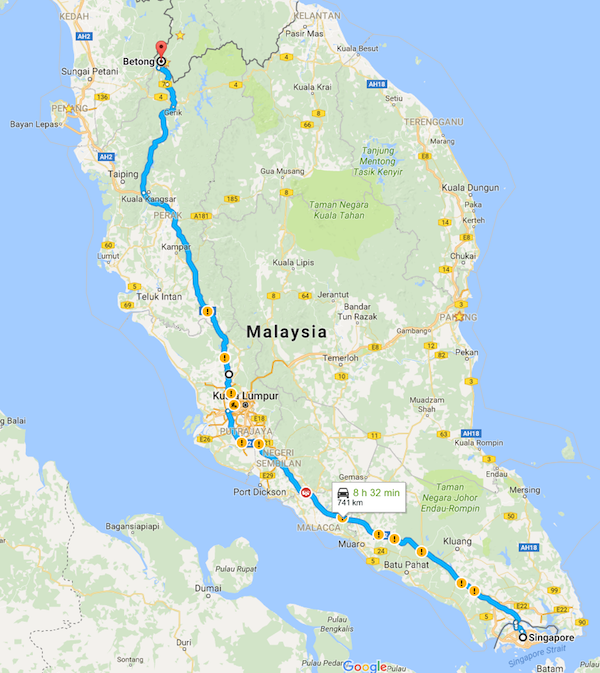 Border crossing wasn’t too difficult, and it was easy peasy on Malaysia’s side. But on the Thai’s end, it was slow and money was involved. =( RM2 for filling up the immigration arrival / departure card, RM2 for stamping the passport, and RM2 for processing the motorcycle’s temporary import permit. 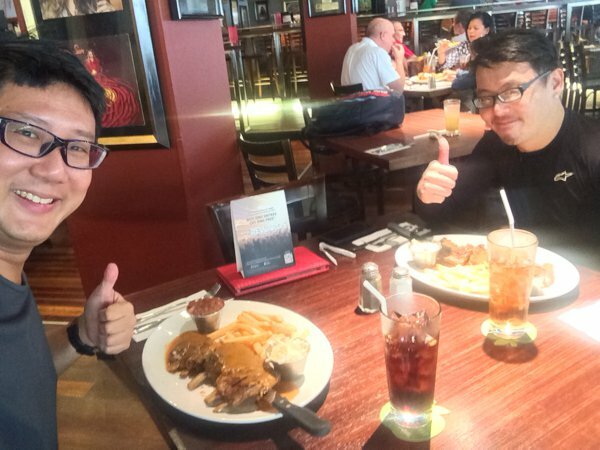 Unfortunately, it was also at this point where I heard that Siu Hon was turned back at the Malaysian border as he had entered Johor using the MACS (Malaysian Automated Clearance System) and therefore didn’t have an entry stamp on his Singapore passport. So, the Malaysian immigration officers refused to let him exit at this border. Bummer, bummer! 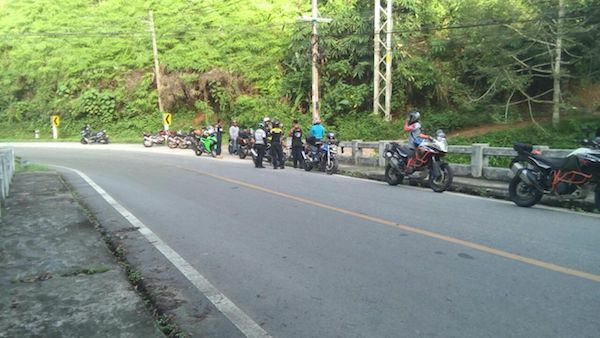 Sadly for Siu Hon, he had to stay in Malaysia by himself while the remaining 15 bikes entered Thailand. Our bikes parked outside the mobile phone specialist store. 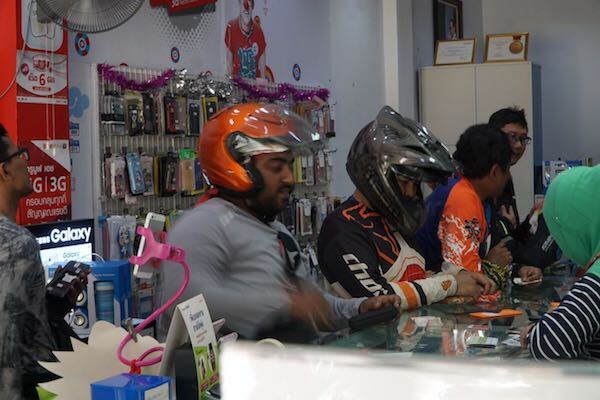 The first stop when we reached the town of Betong was to head to the mobile phone store to get ourselves a data SIM. Modern day adventurers just cannot live without internet data connection. THB50 (SGD2) for the card and THB50 for 3 days of unlimited 4G internet use – very affordable! Waiting in line for our 4G data SIM’s. Next stop – to get to River Rock Palm Resort to check into our rooms. Parked just outside the chalet hut. The rest of the gang unpacking from their bikes as we checked into our rooms. After a short rest, the group headed out for (a very late) lunch at a nearby Halal western food restaurant. Hungry faces waiting for food. Due to the overnight ride, I’ve not slept for over 34hrs straight. I was so tired after lunch that I headed back to the room and went straight to bed. Woke up at 9’ish in the evening (woah!) and headed to town (7mins away) for a quick dinner. 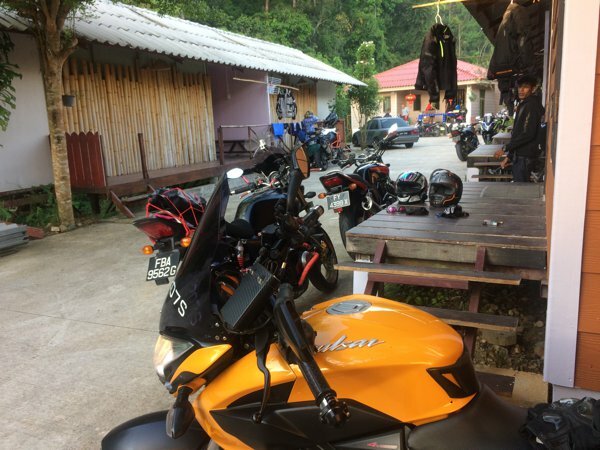 And when I got back to my room, I was (still) so exhausted that I fell asleep again… Zzzz…..
DAY 2 (15 Apr, Sat) – Sea of Clouds, Krasaeng Cave, ride to Penang. The plan today was to head to the Sea of Clouds, then to Krasaeng Cave, before heading to the waterfall for a picnic lunch. 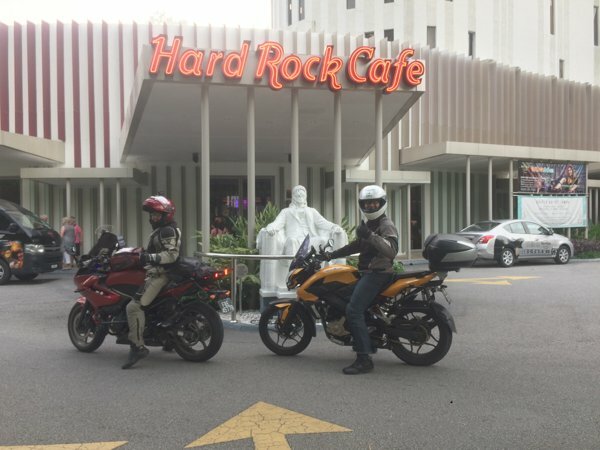 But because Siu Hon was still stuck in Malaysia – alone, I had decided to break off from the group after Krasaeng Cave, and then ride to Penang to join him for dinner. 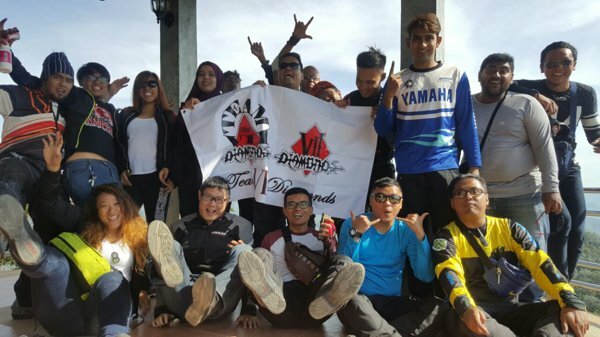 It’s a cardinal rule and bikers’ ethos that when riding in a group to leave no biker behind. Unfortunately, enroute to the Sea of Clouds, we hit a sand patch at corner and one of the Super 4’s skidded. So we all stopped while the medic in the group rendered first aid. Unplanned pit stop due to the skid. Thankfully, the only injuries suffered were skin-deep. Note to rider – gloves are useful. Thankfully, the incident didn’t dampen our mood too much. 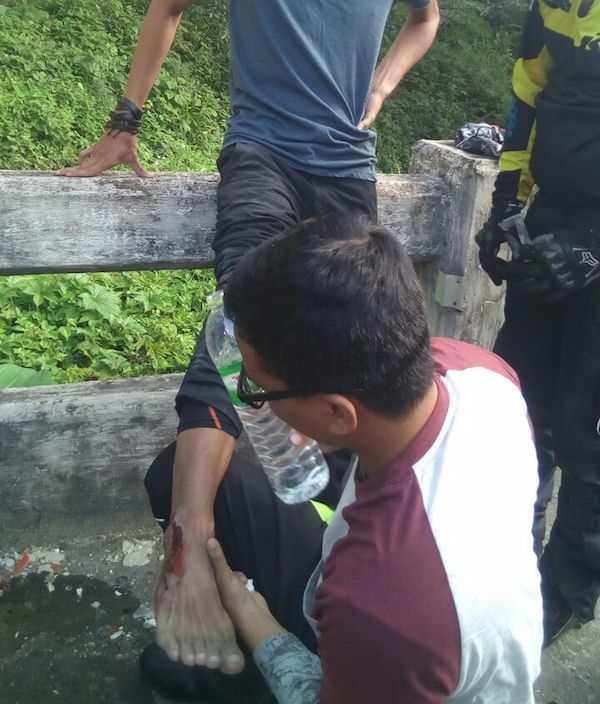 Before long, the wounds were cleaned and dressed, and we made our way to the Sea of Clouds at 680 meters above sea level…. …and we were greeted with THIS! Although we got here a little later than planned, thankfully, the sea of clouds at the Sea of Clouds were still waiting for us. Couldn’t resist a group shot up here! 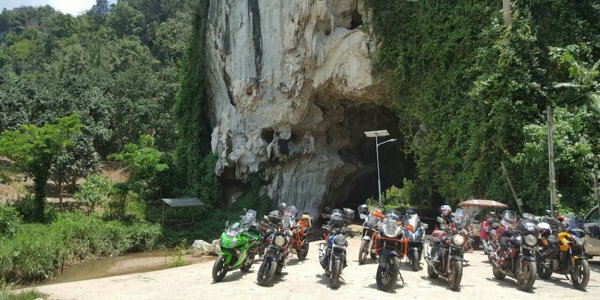 The bikes posing in front of the entrance of Krasaeng Cave. Entering the cave… and into a river. My first river crossing on the Pulsar! Yup! 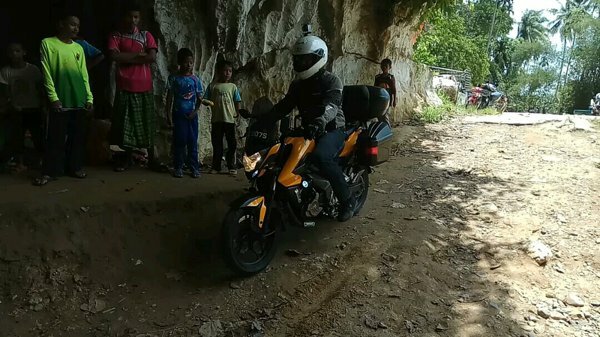 That’s my very first attempt at river crossing on my Pulsar 200NS. As my Pulsar was fully loaded and I had all my stuff with me, I chickened out on the 2nd slippery crossing. The other bikes went through though – with some difficulties. I didn’t want to risk dunking my clothes and stuff in the river in case I tipped over as I’m heading to Penang to meet Siu Hon. 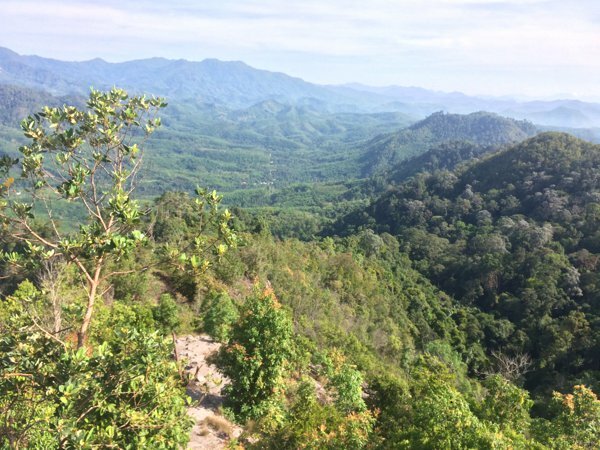 After breaking away from the main group at Krasaeng Cave, I rode alone towards Penang. It’s an approximately 4hr ride to Penang and I was greeted with an amazing weather. Smiley faces once again as I met Siu Hon when I pulled into the hotel’s car park. 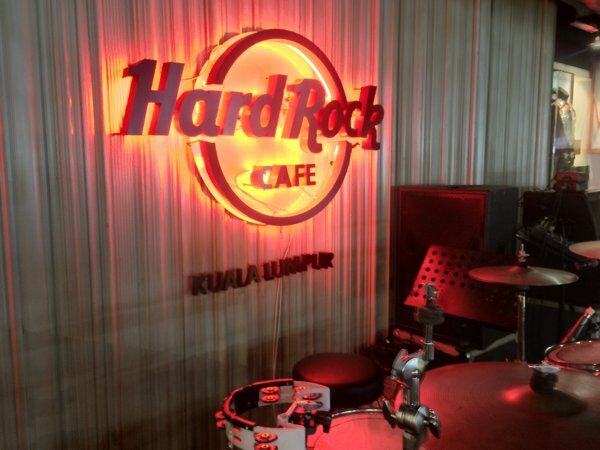 …and we headed to HRC Penang for dinner. 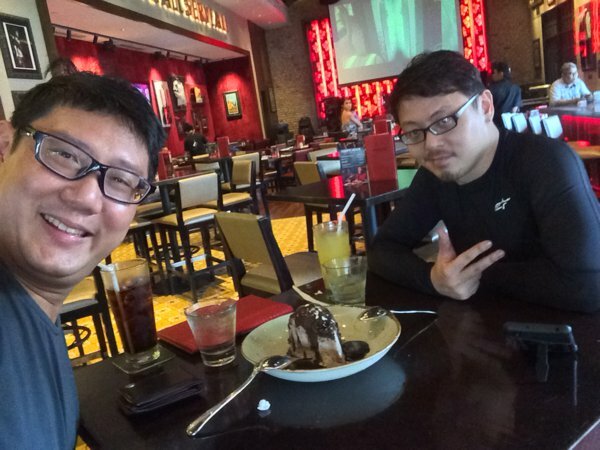 DAY 3 (16 Apr, Sat) – HRC KL, HRC Melaka, and (almost) HRC SG. We reached HRC KL at 1320h. Yummy lamb ribs at HRC KL! 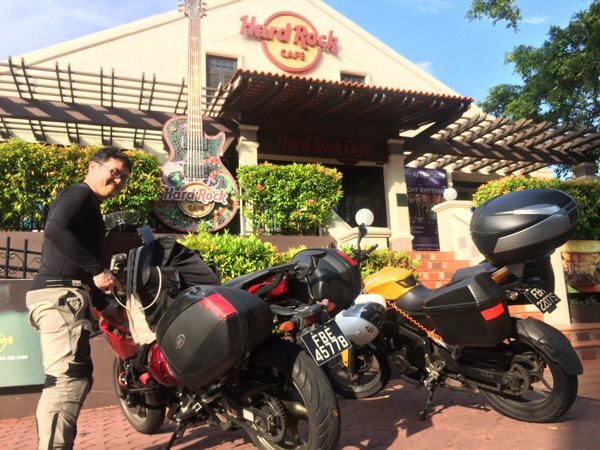 We arrived HRC Melaka at 1730h, and they let us park our “big bikes” in front of the building. We weren’t sufficiently hungry for dinner, and so we opted to share a mud pie instead. 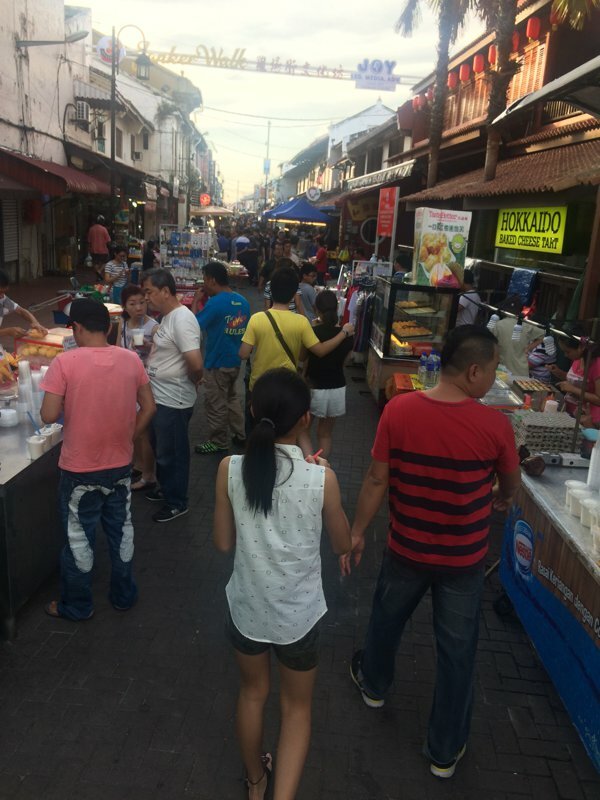 A stroll down Jonker Walk to walk off those mud pie calories. Nevertheless, it was a wonderful long weekend ride! Thank you so much Rano and the 7Diamonds team for organising this!! nice ride man,enjoy reading your posts! It gives me great motivation and encouragement to get me 2b license asap! Bro… Its nice trip… Can u tell me… How much u spend RM for petrol from Singapore to betong Thailand to and fro..